House Republican Rep. Marc Catlin, representing the 58th District in the state House of Representatives, gives an acceptance speech after being nominated to be on the primary ballot. Republican Sen. Don Coram, representing District 6, was nominated by his party to be on the primary ballot Saturday in Dolores. 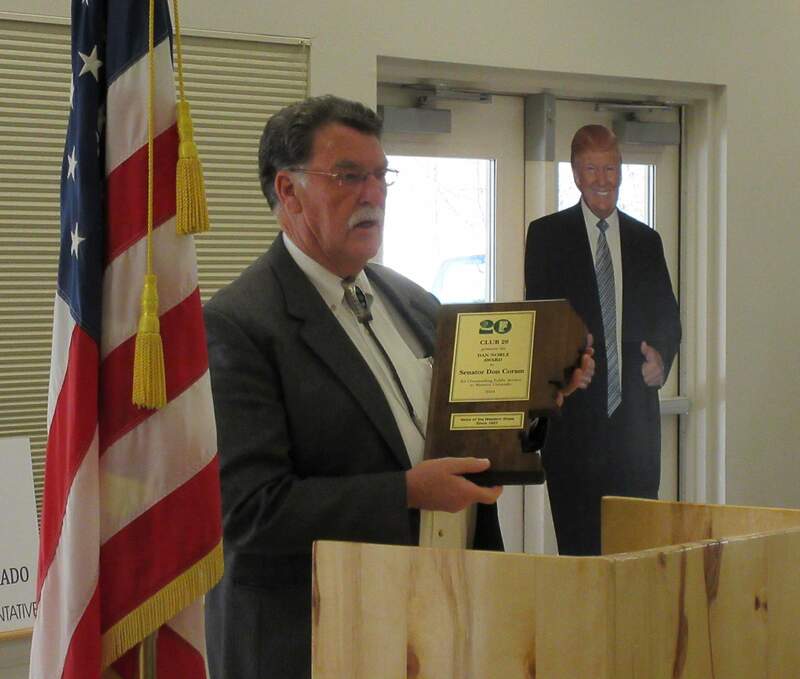 He was also recently awarded the Club 20 Dan Noble Award for his public service work. 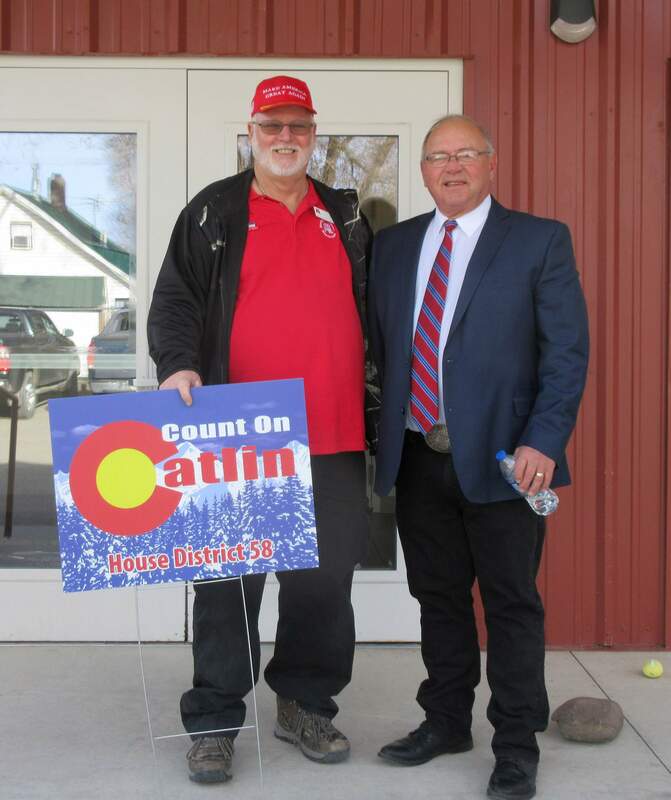 Ray Langston, a Republican Party delegate from Montrose, shows his support for House Rep. Marc Catlin, who represents the local 58th District. Republican delegates from area counties gathered at the Dolores Community Center to nominate their candidates for state Senate District 6 and state House District 58. Incumbent candidates Rep. Marc Catlin and Sen. Don Coram, both Republicans from Montrose, were easily nominated onto the primary ballot by the 88 Republican Assembly delegates. There were no challengers. Candidates must receive at least 30 percent of the delegate vote to get on the ballot. Delegates arrived from Montrose, La Plata, Montezuma, Archuleta, Dolores and San Juan counties. “The purpose is to get our candidates onto the primary ballot, and give party delegates the chance to hear them speak,” said Dave Laursen, Republican Central Committee Chairman for Senate District 6 and House District 58. After being nominated, both candidates gave 15 minute acceptance speeches at the assembly, held Saturday. Coram said he is one of a handful of state legislators who have a home address that is a farm. He said the fact that the Western Slope has 15 percent of the people but 85 percent of the state’s water “puts a target on our back.” Legislation favors urban areas at the expense of rural communities, he said. “The metropolitan Front Range wants our water, and that threatens our rivers, so I will fight for rural water interests,” Coram said. He said water storage is needed on the Eastern Slope is prevent Colorado compact water from flowing into Nebraska, and therefore reduce demand on Western Slope water. He said implementing the Northern Platte Integrated Supply project is needed to accommodate the state’s increasing population, and will protect Southwest Colorado water from being diverted to the Front Range. Catlin also focused on protecting Western Slope water from being diverted through the Continental Divide. He has a farming and water management background, including 17-year career with the Uncompahgre Valley Water Users Association. 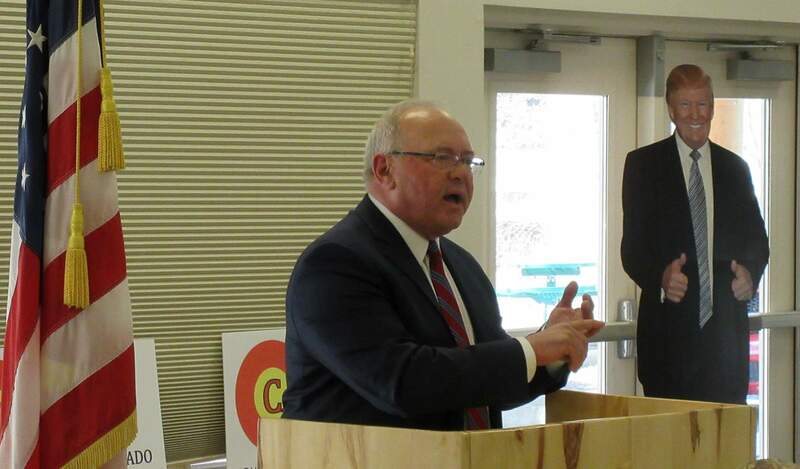 “He is a warrior for you on water issues,” said Coram in nominating Catlin. Every year, 600,000 acre-feet of Colorado River Basin water is diverted to feed cities on the Front Range, Catlin reminded the crowd of about 150 people.